As of writing this, I've logged in well over 15 hours with the newest edition to the 2K family, WWE 2K17, spending an equal amount time between the game mode options and creation portion of the game. So as we go, I'll break down everything notable that's in the game, and things that I feel have been left out. Much like any video game launch nowadays, WWE 2K17 was rough. Many people reported game-breaking glitches in the first few hours of playing, and I experienced several of those same issues. That didn't sit well with the several people that pre-ordered the game, and some even spent $100 for the NXT Edition of the game. A lot of people have experienced things like Goldberg not being a playable character even with the pre-order, random crashing in the MyCareer mode, and the Universe mode is a whole other problem in itself that I'll get to that shortly. A few things I've experienced have been small graphical errors like AJ Styles coming out completely black, and then disappearing halfway through the match (though I still won). While playing as Shawn Michaels against Mankind in a Hell in a Cell match, I was able to hit Sweet Chin Music on top of the cell only to see Mankind disappear through the floor. Though it gave me the win and was pretty comical, it can really turn you off to the game. Luckily, many of the big time glitches causing the game to crash were fixed in the games first official patch a few days ago. Progress! I feel like the biggest part of a wrestling video game is how it plays and who you can play with. After all, characters and the superstars are why we love the business, right? I have very few complaints when it comes to the roster. They have several awesome unlockable characters, which I've gotten them all, but the rating system they used seemed a little funny to me. Brock Lesnar is rated a 95 overall. He is the cover athlete and a real life monster, so I expected this. He is two points higher than the next highest superstars which are John Cena and Seth Rollins at 93. Stone Cold Steve Austin is also a 95, but he is not a character in the modern day MyCareer game mode. Having Lesnar be that high of rating causes him to literally never lose. I've played four months worth of a career so far with two shows a week, and one pay-per-view a month. Lesnar has been the champion since day one and has yet to lose a match, and that can get rather boring at times. The gameplay leaves a lot to be desired for me. They had a big time chance to fine-tune the combat system, but its still the same from its predecessor in 2K16. This makes me think its time for a full scale overhaul with the gameplay for 2K18, and not just some tweaking like I thought. Universe mode is a staple in the WWE 2K video game series. 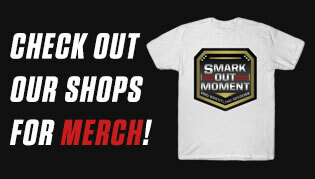 It gives you full control over everything that happens in the world of WWE. You can schedule your own matches, book your own PPV's, and start whatever rivalry you want between any two or more superstars you can dream of. With the new promo system implicated into WWE 2K17, it has gotten even better. Not only have the promo's brought something new to the table, but now with the new creation options you have you can create your own show alongside SmackDown & Raw. I created my show and along with it; its own arena, roster, and its own championship to fight over. But with great advancements come great problems. 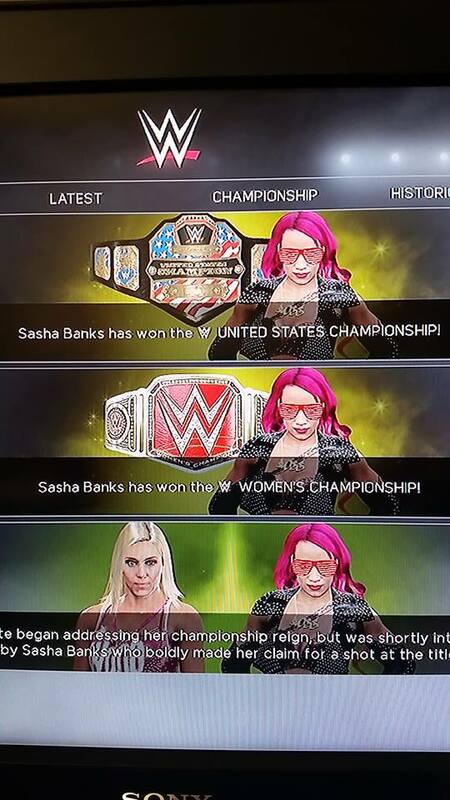 As you can see by the picture, Universe mode has its fair share of glitches. This picture was pulled from the several online complaints/discussions on the game where the main point was that Sasha Banks had somehow been able to win the United States Championship. We all know Sasha has had a way of making history in her career so far with much more to be made in her future, but I don't know if this is something that should be happening. With so many moving parts in Universe mode, something is bound to slip through the cracks. This mode is by far the mode I've spent the least amount of time with, so I'm sure I'll find more as I go. MyCareer is really what 2K seems to be hanging their hat on with WWE 2K17. With several complains over the MyCareer in WWE 2K16, they did a great job with changing things up this year. 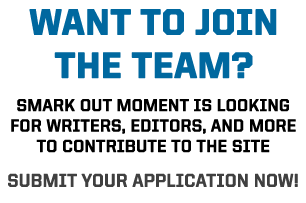 MyCareer gives you the power to create your very own custom superstar, and take him through the ranks of the WWE winning titles, rivalries, and making your own story/history. From the superstars appearance, ring/entrance gear, move-set, and entrance its all up to your creation. After creating your appearance you are sent to the performance center to see head trainer, Matt Bloom, and several other trainees. You put on your first match, which will serve as a tutorial for those who jumped straight to this without playing a quick match, and he'll then tell you what he thought. You'll get to have your first promo by yourself in the ring, and then you'll go one on one with Enzo Amore in a verbal bout to teach you the ins and outs of each promo. You'll have one more Performance Center match against NXT Champion, Samoa Joe, and after that you'll be set free. I was able to defeat Samoa Joe, so I was thrown into the U.S. Championship hunt right away. I'm not sure if anything is different if you were to lose to Samoa Joe while in training. The only complaint I have on the MyCareer mode is that is taking me forever to progress. For those who played WWE 2K16, the way you advance through the championship ranks is the same. You start at #10 on any given title, and then you have to work your way up. I started at #10 in the United States Championship hunt, and I've had three big rivalries. One with Randy Orton, one with Dolph Ziggler, and one with John Cena(who is currently the U.S. Champ on my game). I won all three rivalries but yet I'm still only #4. I am not allowed to go after any other title until I win my first one, and I'm not allowed to advance in the "Paul Heyman Guy" storyline until I win my first main roster title. I've done everything and then some over what has been an in-game four months and I have barely made a dent. Other than that, the new addition of giving promo's has changed the MyCareer completely in the best way, and definitely what I've spent most of my time on. So far, I've really enjoyed myself with WWE 2K17. Being able to play as my favorite wrestler of all time in Shawn Michaels, and have him win all the current championships as well as every title WWE or WCW ever had(all title belts are unlockable) has been a lot of fun for me. From an incredible playable roster, that with pre-orders and getting the NXT Edition could include Goldberg and Shinsuke Nakamura, and awesome game modes this is everything I expected it to be. Yeah the glitches can be pretty annoying sometimes, but also bring some humor every now and then. I'm sure 2K is already preparing the next patch to get rid of these glitches permanently, and that will only make things better. The MyCareer alone is something I'm really enjoying besides the painstaking climb to win any championships, but I have a feeling once I finally get there then it'll open the door to do so much more in the game mode. It's gameplay can be frustrating and seemingly useless at some points, but its something you can get used to and even begin to read when it might mess up. With everything I've experienced so far I'm very comfortable giving this game an 8/10, and something wrestling fans and video game fans alike will definitely enjoy. 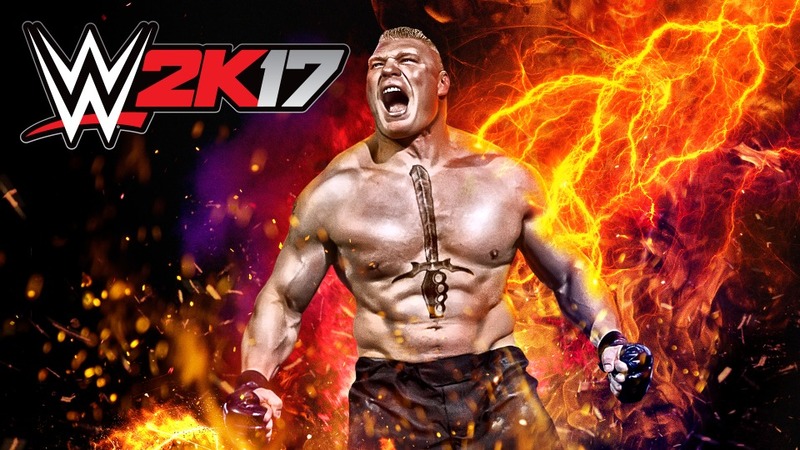 What are your thoughts on WWE 2K17? Do you think it's an improvement or did it fail to live up to expectations?